March, 16, 2008- Well, the site is opened. I initially was going to make a two or three page site just showcasing a few pieces of architecture. But my initial launch has over 120 pages. I have decided to tint the photos a light tannish color as well as avoid the dollar sign on any section of this site. Why? In my book, the dollar symbol equals greed.... so I decided to omit the sign. April, 5, 2008- I have added actual motion picture video from opening day at the Fair! I attempted to contact the American Mutoscope and Biograph Company about sing the footage. I emailed the company and their lawfirm. No one contacted me. So I kept it on the site. It IS 104 years old and is probably copyright-free, but I emailed them as a courtesy. I guess they're too important to reply. April, 28, 2008- Lot's of menu problems... FIXED finally! June 17, 2008- A science teacher from Missouri was the first one to sign the guestbook. Cool. She has promised to send some lesson plans, and was going to send an item and donate. Awesome! I have some neat prizes for the winners of an essay contest. July, 2008- Mark Bowling was the first one to add their opinion of the Fair to this site. I visited St. Louis and Forest Park. Mike Truax gave my wife and I a personal guided tour of some of the highlights from Forest Park. He didn't have to do this; we were strangers. As a small thanks, I have him a framed print of a 1904 WF scene I did and took him and his significant ladyfriend to dinner. I thought I would never go to the Midwest, let along see the St. Louis Arch, Art Museum, etc. The St. Louis visit was too short! October, 2008- Kinda feeling down. Not many hits on this site. I am having a difficult time getting this listing on Goggle and the other search engines. The to my shock, there was another site called Meet Me At the Fair. It was run by two guys who never update their small site and don't even have a current email (or their links were broken). I tried to contact them, to no avail, not knowing if they would take offense at the name of my site. Initially I was going to pull the plug on my Meet Me At The Fair site; a lot of work for little gains. Mike Truax helped me think it over. Rethinking, I did a MASSIVE renaming of my site to AT THE FAIR, and had to change EVERYTHING on my site. What a pain in the neck- it took forever. Had to resubmit links to search engines, which don't consider my site worthy enough I guess, cause I never can find my URL. November, 2008 Still feeling down, not many hits, the science teacher never sent the plans. In fact not one teacher has contacted me since. February, 2009- I have just finished a massive image update and added dozens and dozens of photographs. Some people are disappointed that my site doesn't include their relative that exhibited an item(s) at the Fair. Sorry! A few people wanted me to do their research for them. Not going to happen! Don't be lazy, do your own research! March, 2009- Hits on the site picked up. Quite a few students from high schools signed the guestbook. I had to delete a few because they submitted their email, which as they are minors, I will NOT show to the public. No teachers ever emailed me or followed with their promises. I have no problem with people who do not promise, but do have problems when you say something and don't follow through. April, 9, 2009- Debi McDaniel sent me two lo-res scans of shots from the Train Wreck during the Fair. I posted them after touching them up. I thanked her... still in shock as aside from a scan of a map by Dan Ruth, great ideas, thoughts, and encouragement from Mike Truax, an opinion of the Fair by Mark Bowling, no one in a year has helped out at all. Aside from above mentioned, the only people who email me about the Fair are either folks asking for me to research something for them or promote their Fair-related business without exchanging links. I still have some rather cool prizes for a school Fair contest which includes Fair books and DVDs. Perhaps, there is less interest in the 1904 World's Fair than I thought? Maybe people don't want to spent their time to care. Maybe I'm just ignorant. September, 2009- For five months, I have gotten little traffic, a few comments needling why their relative's wares haven't been listed or shown, and a ton of people asking me to research their ancestors that attended or worked at the Fair. Not one person from any World's Fair club/forum/society has ever offered to help or send an image or even make a comment (well save one on that). No teacher has ever collaborated or sent lesson plans (as were promised). I am cancelling updates for the site until I reevaluate if this is worth it. I might scrape this and make a ginger ale site. And again, like Terry's site, I might just let this site simply rot. Perhaps I simply need to be energized again, hence the long break to work on my Dad's art site aand a secretive site as well. December, 2009- Continued little traffic, As per the norm, not one person from any World's Fair club/forum/society has ever offered to help or send an image or even make a comment (well save one on that). I painted two more images from the Fair. I emailed an important 1904 World's Fair expert about asking his opinion about the 1904 WF. No reply. Regardless, one of the cool things is that I addd three images for attractions that had only text- Ancient Rome, Ostrich Farm and Scenic Railway- all from the Pike. It's more and more dfficult to find/post unique images from the Fair. Later in the month to my suprose, a gentlemen named Byron sent me a few scans of original photos from Fair. THANKS Byron, you are the best! January, 2010- One nice thing that happened was Mike Truax, president of the 1904 WF society sent me a slew of digital pictures from his Fair presentauions. Yes, I already had at least 75% of them, but a few were unique as well as far better resolution. Thanks Mike. You are a an amazing man! 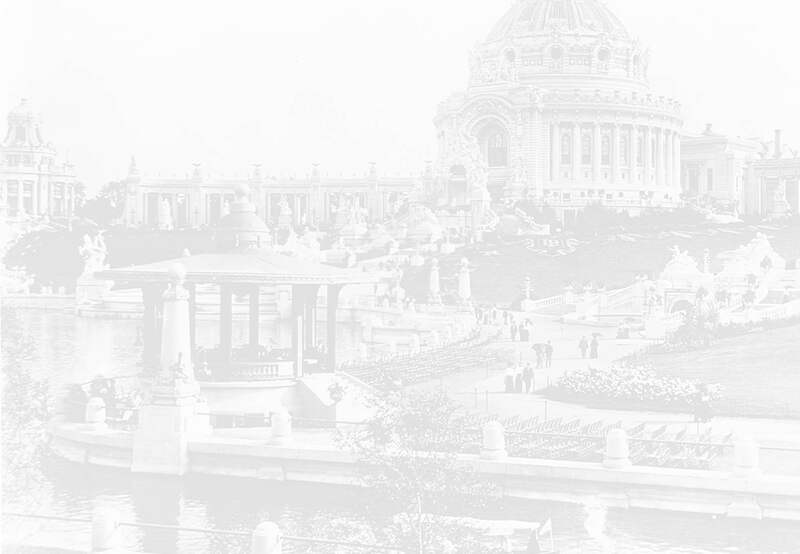 My 1904 World's fair Appreciation group on Facebook has 43 members. More than I ever thought. Thanks!!! April, 2010- Over 11.000 visitors and no guest book postings for a month. It either tells me that people don't care, or most of the visitors are repeaters. You can ignore the ranting of an old fool that loves the 1904 World's Fair by not reading this and clicking on yur browser's back button or the Misc. or Main buttons to the above right.